ﬁnely modelled in dark gray pottery, with high arched neck, the elongated head with delicate features ﬁtted with a red-painted bridle, dressed for parade, with a pair of braided ropes tied around the top of the neck, and with large tassels moulded with ﬂorettes hanging from straps across the chest and on the rump, the long saddle-cloth painted bright red and tied tightly over the saddle with the knotted ends hanging down over the wide saddle-blanket which is lightly combed with irregular fur-markings, standing four-square with splayed hooves resting on a wide rectangular replacement base, the surface showing remains of buff earth from burial overall. Similarly modelled painted pottery horses have been excavated from early 6th century Northern Wei tombs in the vicinity of site of the Northern Wei capital at Luoyang. Compare the ﬁgure of a saddled horse from the tomb of Yuan Shao in Luoyang with a similar knotted saddle cloth, illustrated in Kaogu, 1973, No. 4, pl. 11:1. Compare also the similarly modelled horse from the Gao family tomb in Hebei, illustrated in Wenwu, 1979, No. 3, ﬁg. 44. It is interesting to note that only a single example of this type of caparisoned horse was found in each tomb. 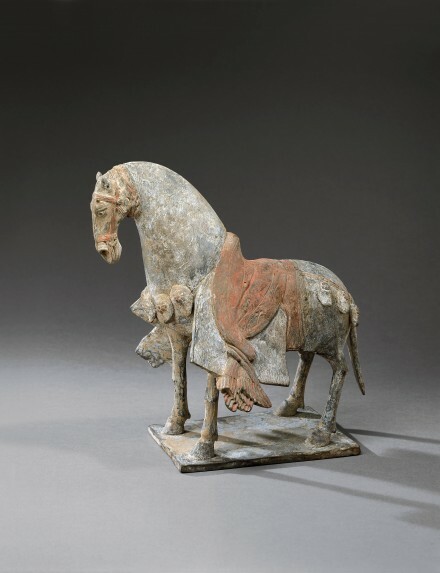 Compare also a similarly modelled Northern Wei painted pottery horse with less ornate decoration, illustrated by Lewis in Into the Afterlife: Han and Six Dynasties Chinese Tomb Sculpture from the Schloss Collection, Vassar Art Gallery, Poughkeepsie, 1990, p. 98, no. 43.